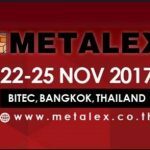 Our distributor Rattorn Co., Ltd., in Thailand, will present Fuji products at METALEX 2017 (the 31th edition of the ASEAN’s largest International Machine Tools and Metalworking Technologies Trade Exhibition and Conference, BITEC, Bangkok, Thailand) from November 22th toNovember 25th, 2017. METALEX 2017 is the largest machine tools and metalworking event in ASEAN where over 10,000 technologies from 3,300 brands will display state-of-the-art capabilities. Over 100,000 participants will discover next level of manufacturing from launches of 4,000 innovations as well as groundbreaking features including first-in-ASEAN “SUPER ROBOTS,” “METALEX Talks,” “100 HOT TECHS,” METALEX conferences, Business Matchmaking, and more.